At the tragically young age of only 69 , Don Van Vliet died (17.12.2010) and we salute him with Borin's painting: Beefheart's Trout Symphony. For tributes and much besides see the link at the bottom of the page. 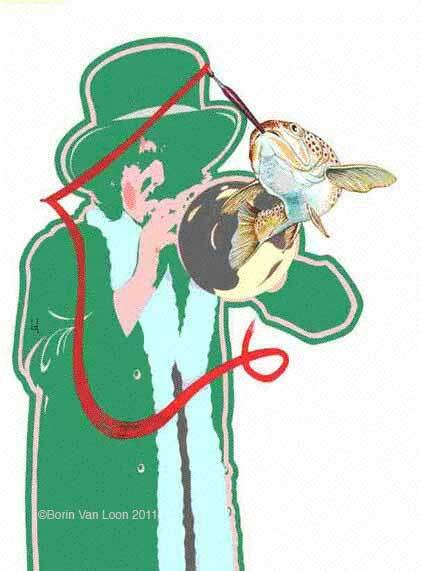 Beefheart's Trout Symphony. Guache on paper. UK price: £28.00 (plus 20% p&p) with stout packaging. Click here to purchase. Borin writes: "Going right back to my roots... When Grant Pringle (fine caricaturist and former member of the band Dawn of the Replicants) at Sun Zoom Spark magazine commissioned me to illustrate the Beefheart article it summoned up the psychedelic posters of the late sixties which turned me on to doing my own art. It was a deliberate reference to incorporate the brown trout (because it was actually a carp's head on the cover of Beefheart's Trout Mask Replica album as any fuel kno) with Don Van Vliet's later career as abstract painter." This image was used on a poster to advertise Borin Van Loon's illustrated talk on his work as collagist, illustrator and painter and to share what motivates and inspires him (that's what it says on the poster) in an event organised by Ipswich Art Society at the Co-operative Educational Centre, Fore Street, Ipswich at 7.30pm on Monday 26 September 2011. 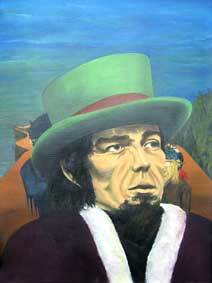 "Writing about Beefheart's Trout also remindes me that one of the first ever proper paintings in oils I did The propensity of the English for queuing was a head and shoulders of the good Captain (wearing green topper, of course) at the head of a queue consisting of Batman, Antennae Jimmy Semens (in bath cap) and several score others. Here's a quick look at that very early painting now that the original has been unearthed."